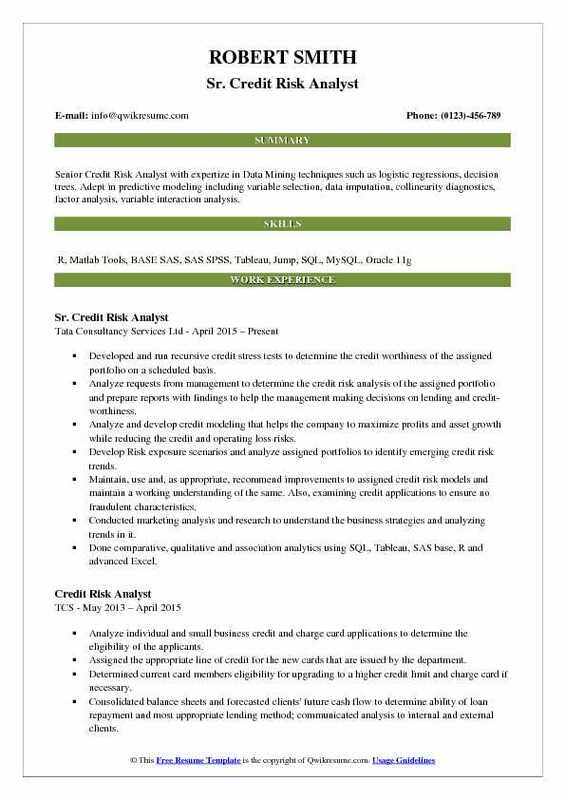 The Credit Risk Analyst job role is of key importance for any organization, the Credit risk Analyst reviews and assesses the organization’s financial history. Sometimes Credit Risk Analyst will also work for individuals. 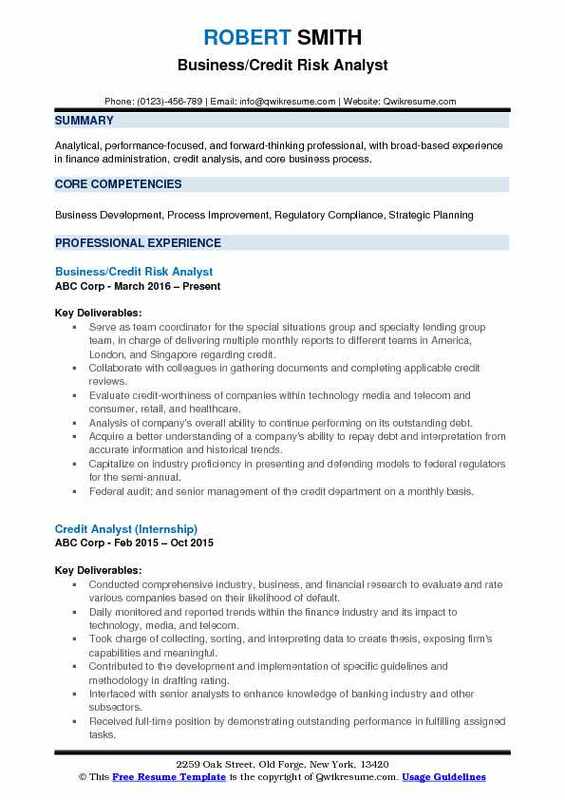 In simple terms, a credit Risk Analyst has to analyze the credit capacity of the candidate to whom the loan is given, the role of a credit risk analyst is too crucial for the firm, as the decision to give loan depends solely on the opinion and review of the Credit Risk Analyst. The responsibilities of a Credit analyst doesn’t stop over here, as it is their duty to fix the loan interest rates that are to be applied. The other responsibilities for this post include evaluation of financial data, balance sheet, income statement, determining default risk level, report preparation and calculating financial ratios. 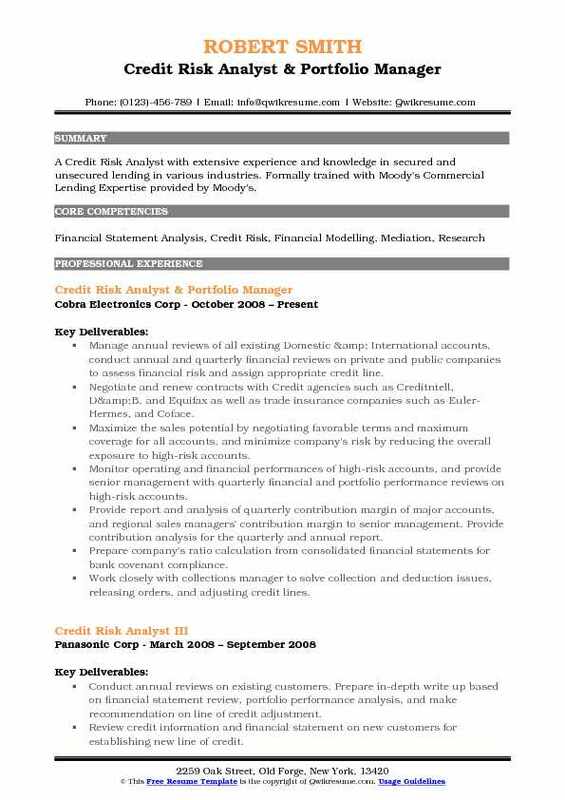 Normally a Credit Risk Analyst Resume Sample that has a Bachelor’s degree in Finance, Economics or accounting or Mathematics is considered for the post. 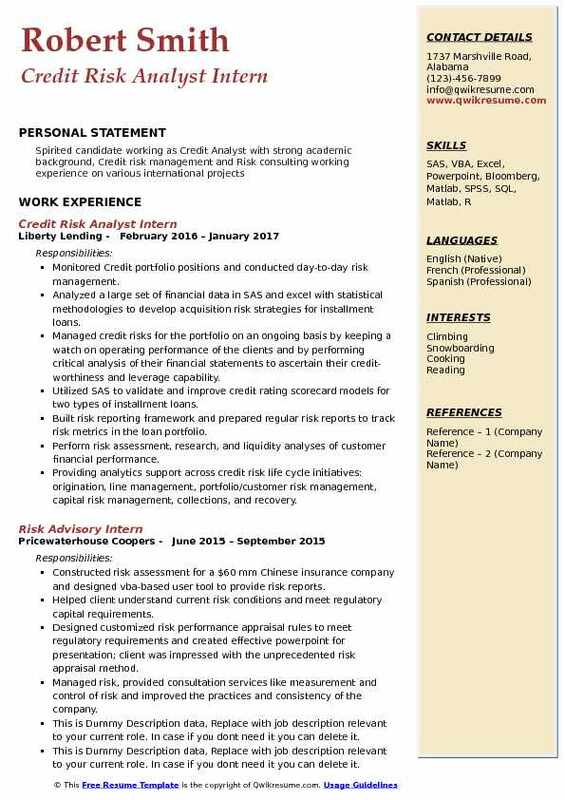 Objective : 4+ years experience in credit risk analysis including personal, Banking, commercial credits, FI counterparties, and consumer products. Possess excellent knowledge of financial services, accounting principles and reporting. Analyze credit information to determine the risk involved in corporate lending and prepare reports of findings. Utilize applicable software program to track and monitor companies' compliance with covenants. Support relationship managers, portfolio managers, and credit risk managers by spreading personal, business financial statements and tax returns. Preparing global cash flows, stress testing projections, and borrowers, ensuring proper loan. Analyzing guarantor support, monitoring loan covenants, analyzing market research, and environmental risk. Background and debt recap, collateral and guarantor analysis and then submitted for approval to the appropriate credit authorities. 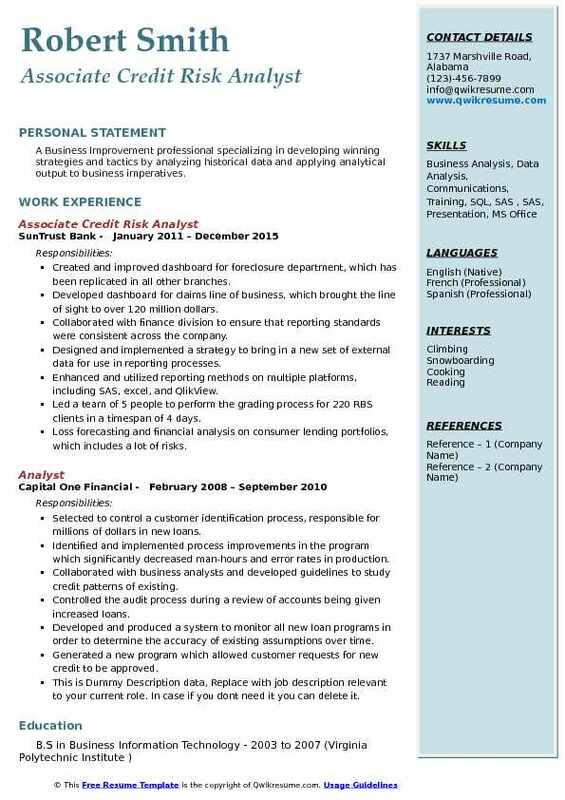 Objective : Analytical, performance-focused, and forward-thinking professional, with broad-based experience in finance administration, credit analysis, and core business process. Serve as team coordinator for the special situations group and specialty lending group team, in charge of delivering multiple monthly reports to different teams in America, London, and Singapore regarding credit. Collaborate with colleagues in gathering documents and completing applicable credit reviews. Evaluate credit-worthiness of companies within technology media and telecom and consumer, retail, and healthcare. Analysis of company's overall ability to continue performing on its outstanding debt. Acquire a better understanding of a company's ability to repay debt and interpretation from accurate information and historical trends. Capitalize on industry proficiency in presenting and defending models to federal regulators for the semi-annual. Federal audit; and senior management of the credit department on a monthly basis. 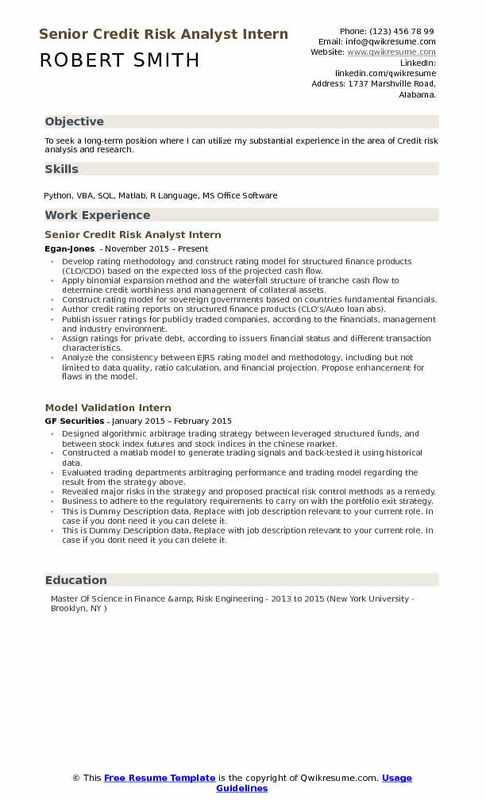 Headline : Senior Credit Risk Analyst with expertize in Data Mining techniques such as logistic regressions, decision trees. Adept in predictive modeling including variable selection, data imputation, collinearity diagnostics, factor analysis, variable interaction analysis. Developed and run recursive credit stress tests to determine the credit worthiness of the assigned portfolio on a scheduled basis. Analyze requests from management to determine the credit risk analysis of the assigned portfolio and prepare reports with findings to help the management making decisions on lending and credit-worthiness. Analyze and develop credit modeling that helps the company to maximize profits and asset growth while reducing the credit and operating loss risks. Develop Risk exposure scenarios and analyze assigned portfolios to identify emerging credit risk trends. Maintain, use and, as appropriate, recommend improvements to assigned credit risk models and maintain a working understanding of the same. Also, examining credit applications to ensure no fraudulent characteristics. Conducted marketing analysis and research to understand the business strategies and analyzing trends in it. Done comparative, qualitative and association analytics using SQL, Tableau, SAS base, R and advanced Excel. 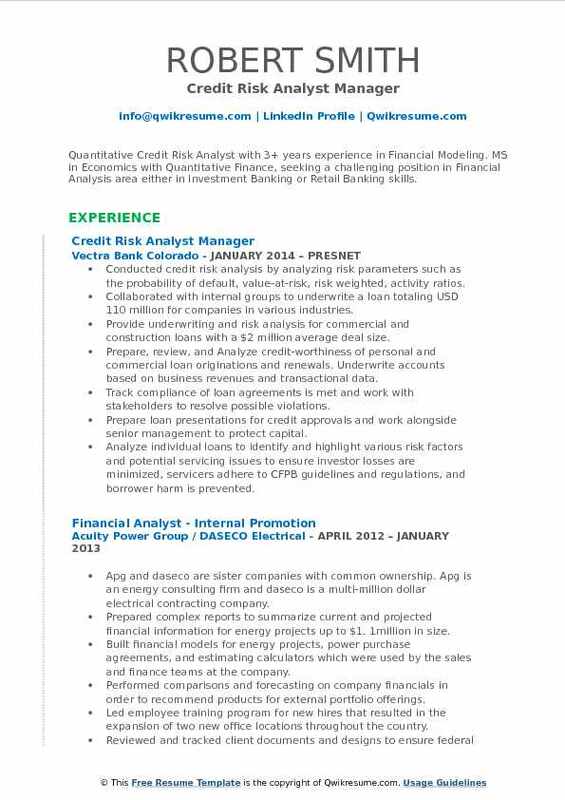 Objective : Quantitative Credit Risk Analyst with 3+ years experience in Financial Modeling. MS in Economics with Quantitative Finance, seeking a challenging position in Financial Analysis area either in Investment Banking or Retail Banking skills. Conducted credit risk analysis by analyzing risk parameters such as the probability of default, value-at-risk, risk weighted, activity ratios. Collaborated with internal groups to underwrite a loan totaling USD 110 million for companies in various industries. Provide underwriting and risk analysis for commercial and construction loans with a $2 million average deal size. Prepare, review, and Analyze credit-worthiness of personal and commercial loan originations and renewals. Underwrite accounts based on business revenues and transactional data. Track compliance of loan agreements is met and work with stakeholders to resolve possible violations. Prepare loan presentations for credit approvals and work alongside senior management to protect capital. Analyze individual loans to identify and highlight various risk factors and potential servicing issues to ensure investor losses are minimized, servicers adhere to CFPB guidelines and regulations, and borrower harm is prevented. Headline : A Business Improvement professional specializing in developing winning strategies and tactics by analyzing historical data and applying analytical output to business imperatives. Created and improved dashboard for foreclosure department, which has been replicated in all other branches. Developed dashboard for claims line of business, which brought the line of sight to over 120 million dollars. Collaborated with finance division to ensure that reporting standards were consistent across the company. Designed and implemented a strategy to bring in a new set of external data for use in reporting processes. Enhanced and utilized reporting methods on multiple platforms, including SAS, excel, and QlikView. Led a team of 5 people to perform the grading process for 220 RBS clients in a timespan of 4 days. Loss forecasting and financial analysis on consumer lending portfolios, which includes a lot of risks. Summary : SAS certified credit risk and data analyst experienced in risk modeling and data analysis looking to apply well-established quantitative and analytical skills to a dynamic and fast-paced financial firm. 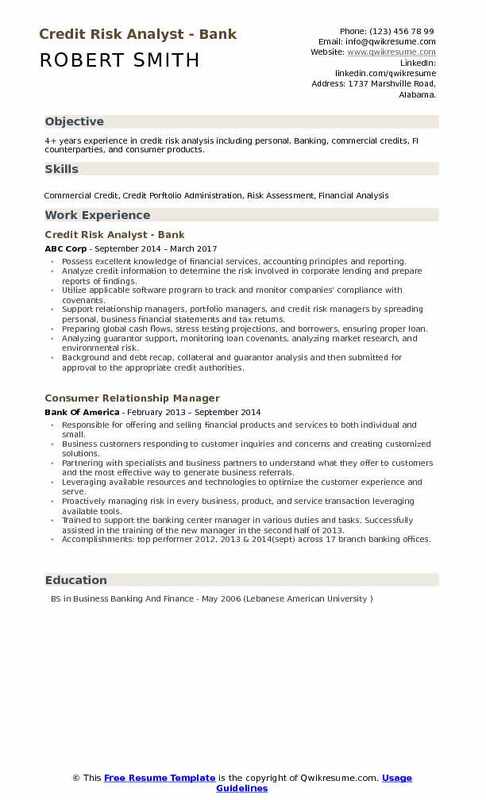 Skills : Excel, Microsoft Office, AS400, Accounting Principles, PeopleSoft. Responsible for managing the credit risk portfolio of B2B accounts for an assigned division of Automotive LLC commercial stores. Act as a risk management analyst to ensure the assets of Automotive LLC are protected. 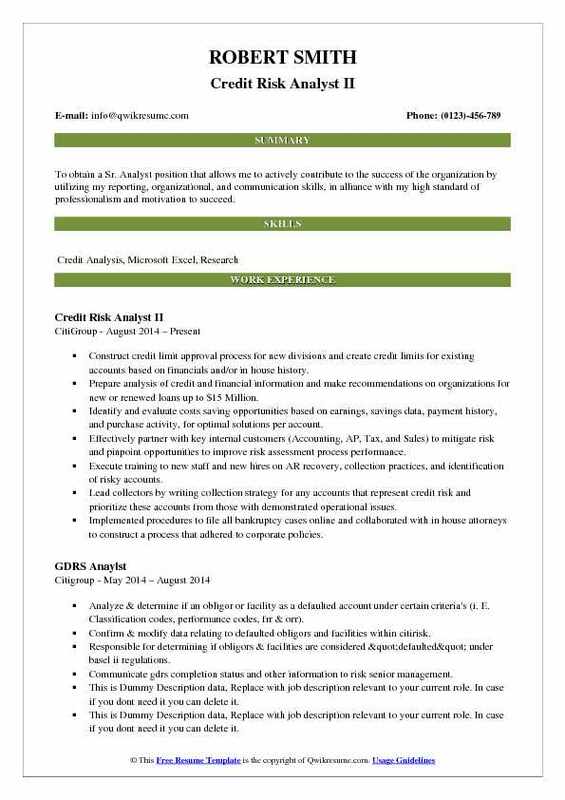 Performed credit analysis for B2Baccounts through analyzing business and consumer credit reports from Dun and Bradstreet, Experian business and personal reports with credit and bank references and financial statements. Determine B2B account types for customers after a credit analysis has been performed, i. E. Cod, Daily, Weekly, Monthly per defined criteria. Analyzed "80% of Credit" reports determining a resolution to lower the high usage of customer's credit limit. Made decisions on the setting credit limits within the parameters of Automotive's guidelines. Performed collection duties on customers over their credit limit and non-complaint with agreed Automotive's payment terms. 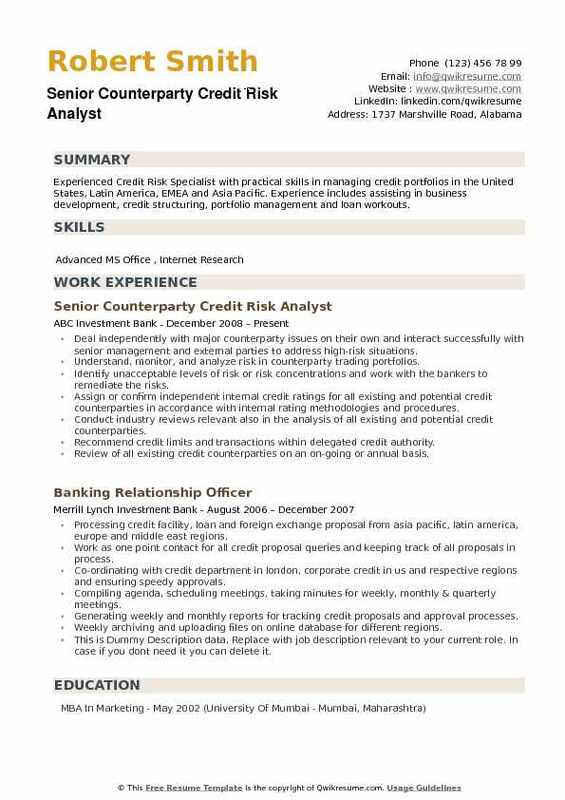 Summary : Senior Business professional with 13 years of experience in Banking and Finance industry. Extensive experience with high valued clients, confidential information and aggressive timelines. Results-driven ac. Analyze credit exposures across merchant portfolios up to $2 million annually. 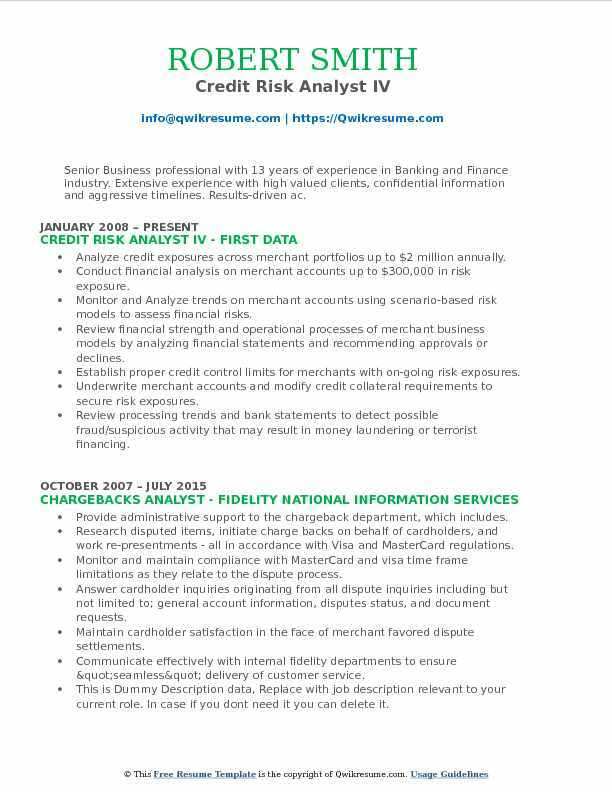 Conduct financial analysis on merchant accounts up to $300,000 in risk exposure. Monitor and Analyze trends on merchant accounts using scenario-based risk models to assess financial risks. Review financial strength and operational processes of merchant business models by analyzing financial statements and recommending approvals or declines. Establish proper credit control limits for merchants with on-going risk exposures. Underwrite merchant accounts and modify credit collateral requirements to secure risk exposures. Review processing trends and bank statements to detect possible fraud/suspicious activity that may result in money laundering or terrorist financing. Summary : A Credit Risk Analyst with extensive experience and knowledge in secured and unsecured lending in various industries. Formally trained with Moody's Commercial Lending Expertise provided by Moody's. Manage annual reviews of all existing Domestic & International accounts, conduct annual and quarterly financial reviews on private and public companies to assess financial risk and assign appropriate credit line. Negotiate and renew contracts with Credit agencies such as Creditntell, D&B, and Equifax as well as trade insurance companies such as Euler-Hermes, and Coface. Maximize the sales potential by negotiating favorable terms and maximum coverage for all accounts, and minimize company's risk by reducing the overall exposure to high-risk accounts. Monitor operating and financial performances of high-risk accounts, and provide senior management with quarterly financial and portfolio performance reviews on high-risk accounts. Provide report and analysis of quarterly contribution margin of major accounts, and regional sales managers' contribution margin to senior management. Provide contribution analysis for the quarterly and annual report. Prepare company's ratio calculation from consolidated financial statements for bank covenant compliance. Work closely with collections manager to solve collection and deduction issues, releasing orders, and adjusting credit lines. Monitored Credit portfolio positions and conducted day-to-day risk management. Analyzed a large set of financial data in SAS and excel with statistical methodologies to develop acquisition risk strategies for installment loans. Managed credit risks for the portfolio on an ongoing basis by keeping a watch on operating performance of the clients and by performing critical analysis of their financial statements to ascertain their credit-worthiness and leverage capability. Utilized SAS to validate and improve credit rating scorecard models for two types of installment loans. Built risk reporting framework and prepared regular risk reports to track risk metrics in the loan portfolio. Perform risk assessment, research, and liquidity analyses of customer financial performance. Providing analytics support across credit risk life cycle initiatives: origination, line management, portfolio/customer risk management, capital risk management, collections, and recovery. Summary : Experienced Credit Risk Specialist with practical skills in managing credit portfolios in the United States, Latin America, EMEA and Asia Pacific. Experience includes assisting in business development, credit structuring, portfolio management and loan workouts. Deal independently with major counterparty issues on their own and interact successfully with senior management and external parties to address high-risk situations. Understand, monitor, and analyze risk in counterparty trading portfolios. Identify unacceptable levels of risk or risk concentrations and work with the bankers to remediate the risks. Assign or confirm independent internal credit ratings for all existing and potential credit counterparties in accordance with internal rating methodologies and procedures. Conduct industry reviews relevant also in the analysis of all existing and potential credit counterparties. Recommend credit limits and transactions within delegated credit authority. Review of all existing credit counterparties on an on-going or annual basis. 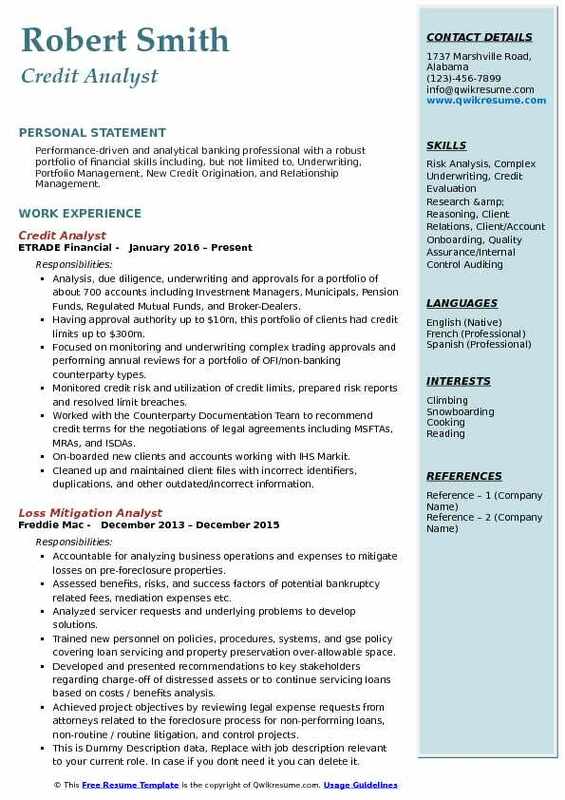 Objective : To seek a long-term position where I can utilize my substantial experience in the area of Credit risk analysis and research. Develop rating methodology and construct rating model for structured finance products (CLO/CDO) based on the expected loss of the projected cash flow. Apply binomial expansion method and the waterfall structure of tranche cash flow to determine credit worthiness and management of collateral assets. Construct rating model for sovereign governments based on countries fundamental financials. Author credit rating reports on structured finance products (CLO's/Auto loan abs). Publish issuer ratings for publicly traded companies, according to the financials, management and industry environment. Assign ratings for private debt, according to issuers financial status and different transaction characteristics. Analyze the consistency between EJRS rating model and methodology, including but not limited to data quality, ratio calculation, and financial projection. Propose enhancement for flaws in the model. Objective : Over 10 years of Commercial Finance including Credit and Collections Analysis, Accounts Payable, National and International Purchasing, Shipping and Receiving, Office Management, and Loan processing. Collected, maintained, and updated commercial and consumer loan portfolios of more than 100 business loans ranging from $500K to $2M. Provided minor to moderate market research, financial and credit analysis, business analysis, forecasting, and budgeting. Create risk assessment templates using pivot tables, graphs, charts, and other various methods to analyze and distribute data. Support management presentations and provide analysis for monthly consumer risk committee meetings. Attended FICO and Experian business conferences to discuss industry trends with leading experts. 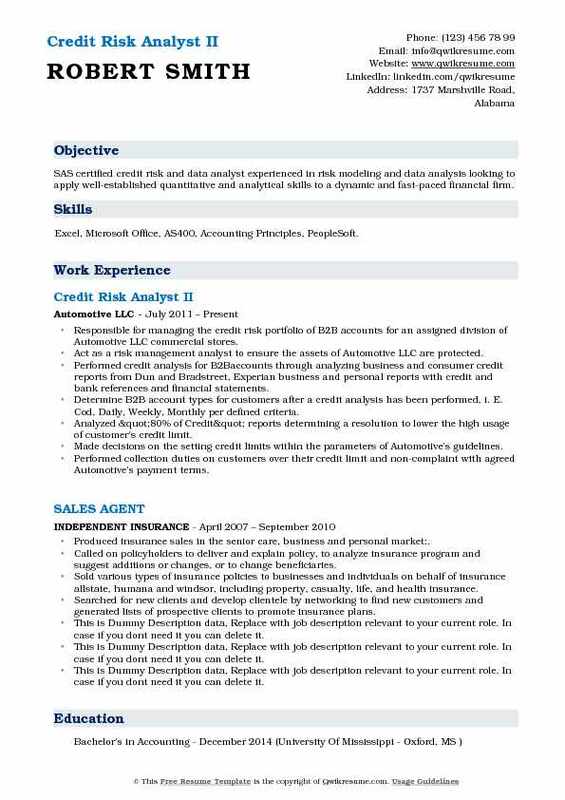 Headline : To obtain a Sr. Analyst position that allows me to actively contribute to the success of the organization by utilizing my reporting, organizational, and communication skills, in alliance with my high standard of professionalism and motivation to succeed. Construct credit limit approval process for new divisions and create credit limits for existing accounts based on financials and/or in house history. Prepare analysis of credit and financial information and make recommendations on organizations for new or renewed loans up to $15 Million. Identify and evaluate costs saving opportunities based on earnings, savings data, payment history, and purchase activity, for optimal solutions per account. Effectively partner with key internal customers (Accounting, AP, Tax, and Sales) to mitigate risk and pinpoint opportunities to improve risk assessment process performance. Execute training to new staff and new hires on AR recovery, collection practices, and identification of risky accounts. Lead collectors by writing collection strategy for any accounts that represent credit risk and prioritize these accounts from those with demonstrated operational issues. Implemented procedures to file all bankruptcy cases online and collaborated with in house attorneys to construct a process that adhered to corporate policies. 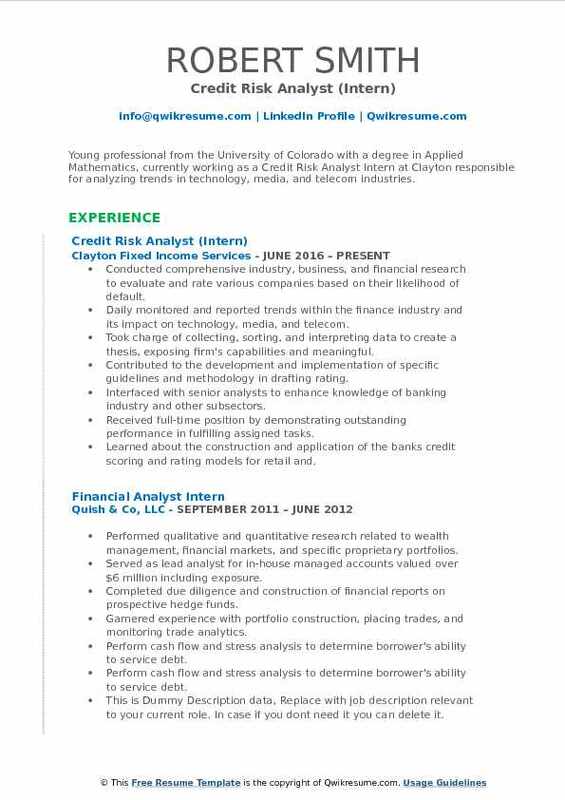 Objective : Young professional from the University of Colorado with a degree in Applied Mathematics, currently working as a Credit Risk Analyst Intern at Clayton responsible for analyzing trends in technology, media, and telecom industries. Conducted comprehensive industry, business, and financial research to evaluate and rate various companies based on their likelihood of default. Daily monitored and reported trends within the finance industry and its impact on technology, media, and telecom. Took charge of collecting, sorting, and interpreting data to create a thesis, exposing firm's capabilities and meaningful. Contributed to the development and implementation of specific guidelines and methodology in drafting rating. Interfaced with senior analysts to enhance knowledge of banking industry and other subsectors. Received full-time position by demonstrating outstanding performance in fulfilling assigned tasks. Learned about the construction and application of the banks credit scoring and rating models for retail and. 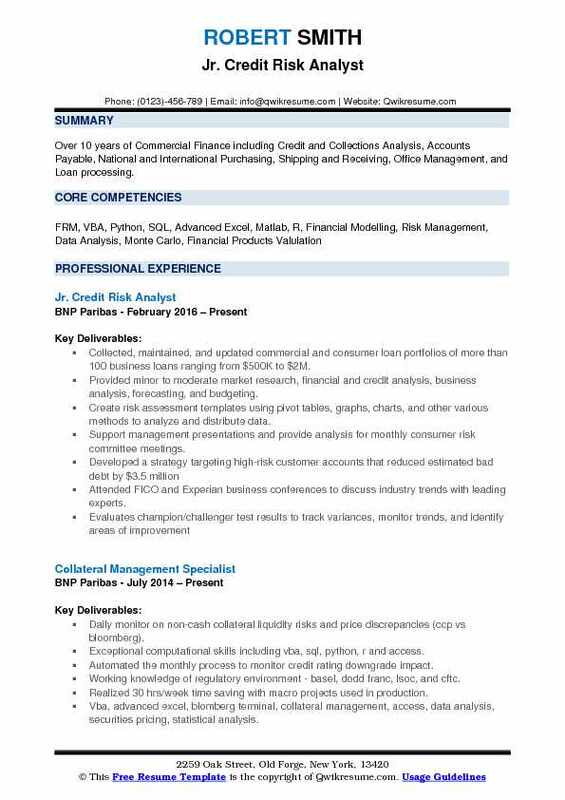 Objective : Performance-driven and analytical banking professional with a robust portfolio of financial skills including, but not limited to, Underwriting, Portfolio Management, New Credit Origination, and Relationship Management. Analysis, due diligence, underwriting and approvals for a portfolio of about 700 accounts including Investment Managers, Municipals, Pension Funds, Regulated Mutual Funds, and Broker-Dealers. Having approval authority up to $10m, this portfolio of clients had credit limits up to $300m. Focused on monitoring and underwriting complex trading approvals and performing annual reviews for a portfolio of OFI/non-banking counterparty types. Monitored credit risk and utilization of credit limits, prepared risk reports and resolved limit breaches. Worked with the Counterparty Documentation Team to recommend credit terms for the negotiations of legal agreements including MSFTAs, MRAs, and ISDAs. On-boarded new clients and accounts working with IHS Markit. Cleaned up and maintained client files with incorrect identifiers, duplications, and other outdated/incorrect information.